Aurora Receptions is the exquisite setting to celebrate your Wedding Day with those you treasure most. We offer you and your guests our experienced Hospitality, along with our quality service and immediate attention to your every need. Aurora Receptions specialise in making your Wedding day a treasured memorable and joyous occasion. We have three different receptions rooms that vary in size, which are capable of seating 50 up to 400 of your wedding guests. We also supply you the benefit of having car parking spaces for your guests located at Aurora Receptions. 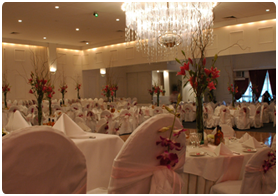 Aurora Receptions ensure that your Wedding Reception will be all that you could possibly dream of.